I have been asked several questions about what I think of the comments made by Duck Dynasty's Phil Robertson and the subsequent action taken by A&E. I'll admit that I do not find this story terribly compelling, but the questions keep coming so I'll attempt to answer them in this post. What did you think about the comments Robertson made in the GQ interview? I thought the comments were an example of religiously-motivated bigotry. It makes me sad that this sort of ignorance and hatred is as common as it seems to be in the United States at this time, but I cannot say that I'm surprised to see it. Do you consider Robertson a bigot, a homophobe, and/or a racist? If I had nothing more to go on than the comments printed in the GQ article, my answer would have to be no. The comments were certainly bigoted, homophobic, and racist; however, I would not conclude on this basis alone that Robertson himself is necessarily all of these things. Having said that, I'd revisit the possibility that Robertson might in fact deserve such labels if additional statements along these lines were to surface. The more of these statements that surfaced, the more convinced I would become that this was a pattern and that the labels might be fully deserved. But didn't Robertson have the right to say what he said? Of course he had the right to say what he said. But having that right does not mean that he also has the right not to face any consequences for what he said. Do you think A&E should have suspended him? I'm assuming that their decision to suspend him was made in consultation with their attorneys and of his contract. Since I was not privy to this information, I do not feel like I am in a position to say whether they should have done what they did. I do not know all the factors involved in their decision or the process by which they reached their decision. I can imagine circumstances where they appropriately decided that suspending him was in their best interests. I can imagine circumstances where they prematurely caved in to public outrage. It is my understanding that they were his employer and that they almost certainly the legal right to take the action they took. But what about Martin Bashir? Neither of these cases have much of anything to do with free speech. It is quite common for employers to define the boundaries of acceptable speech and to punish those who deviate from them. This is not what the First Amendment protects us from; it protects us from government restrictions. Robertson had the right to say what he said to GQ. The First Amendment offers him no protection from how his employer reacted to what he said. Are you surprised at the level of support Robertson has received since A&E suspended him? No, not at all. I am disappointed by it, but I cannot say that it surprises me. Bigotry is still a significant problem in the United States. Have you ever watched Duck Dynasty? Yes, I believe I have watched 2-3 episodes roughly a year ago. A friend was raving about how much he loves it, so I thought I'd check it out. I can't say I hated it, but I did not understand the appeal. So you are just biased because you didn't like the show, huh? No, my feelings about the show have no bearing on my opinion of Robertson's comments or A&E's decision. There are plenty of TV shows I find far more objectionable than anything I saw on Duck Dynasty. But what about religion? Doesn't all this have something to do with religion? Yes, it appears that Robertson's bigoted statements were based on his fundamentalist Christian beliefs. This hardly seems surprising. 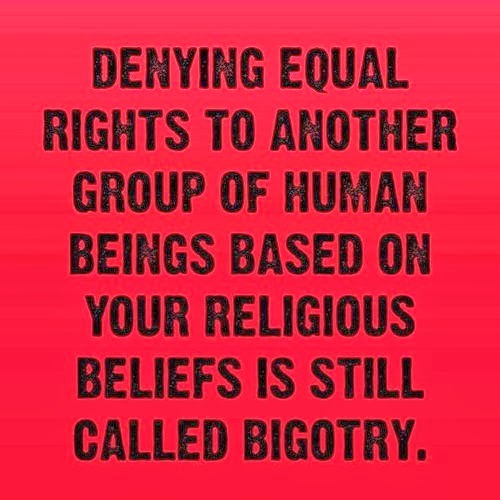 The relevant point to be made here - and everywhere else it needs to be made - is that religiously-motivated bigotry is still bigotry. 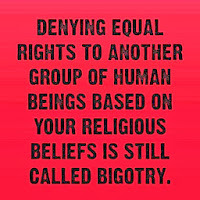 Being able to point to specific passages in the Christian bible to justify one's bigotry does not make it any more acceptable. Frankly, I've had a hard time finding this story nearly as interesting as many others seem to. I do not plan to spend any more time on it than this, but I figured it made sense to answer a few of the questions I have been asked repeatedly in the last few days.